In Peter Pan in Kensington Gardens, J.M. Barrie first created Peter Pan as a baby, living a wild and secret life with birds and fairies in the middle of London. Later Barrie let this remarkable child grow a little older and he became the boy-hero of Neverland, making his first appearance, with Wendy, Captain Hook, and the Lost Boys, in Peter and Wendy. The Peter Pan stories were Barrie's only works for children but, as their persistent popularity shows, their themes of imaginative escape continue to charm even those who long ago left Neverland. 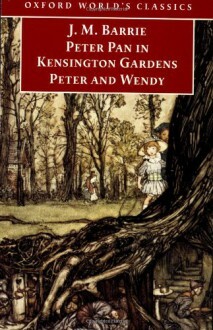 This is the first edition to include both texts in one volume and the first to a present an extensively annotated text for Peter Pan in Kensington Gardens. I plan on decorating my room as a Peter Pan theme. So I think this would be a good story to read on the first day of school or even the first week of school.